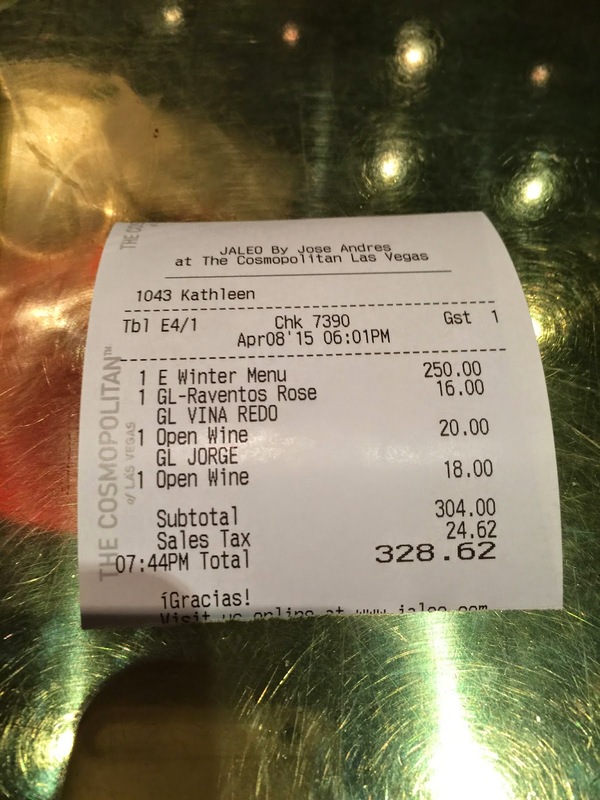 LAS VEGAS DAZE: e' Jose Andres-Third Time's The Charm, best dining experience so far! 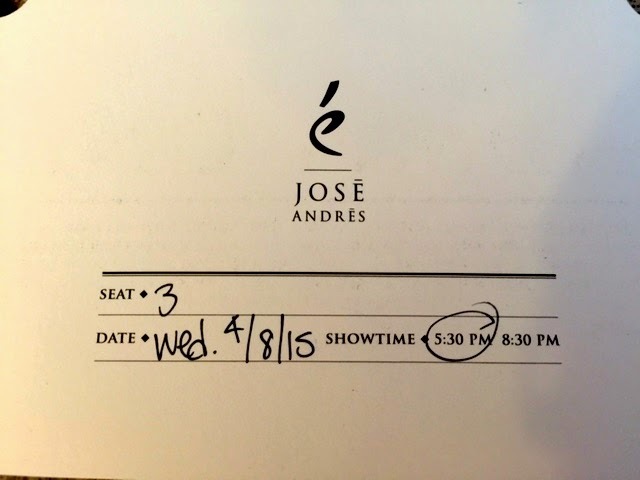 e' Jose Andres-Third Time's The Charm, best dining experience so far! 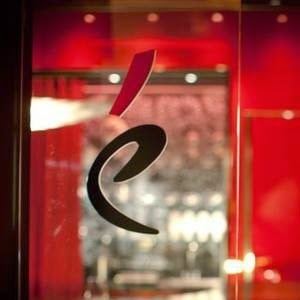 There are so many great restaurants in Las Vegas with new ones arriving almost monthly I thought I wouldn't return to e' for at least a couple more years if at all, but five of my friends wanted to go this year, so I found myself arranging a dinner at e' for our party of six. 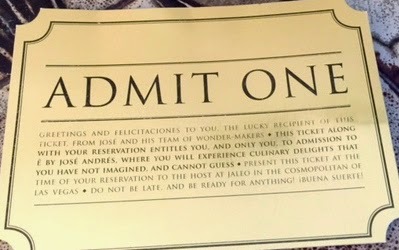 A week before our dinner I received our six golden tickets and on the back it had our date, time and seats. For those of you reading this who play slots, I now have three Golden Tickets from e', if only I could get the 5k Golden Ticket in the Willy Wonka slot bonus too! Our menu for the evening below, it lists some of the courses, but not all. We had 25 or 26 courses this night and while most were small, at the end of the evening no one left hungry and several of us were extremely full! It might also be possible if there is only one or two of you wanting to dine there to get a last minute reservation due to a cancellation. There are two seatings a night of eight guests at each sitting, one at 5:30pm, the other at 8:30pm and you are requested to get there 15 to 30 minutes earlier then your seating to go over drinks and other options. Prior to dining there after your reservation is made they will send you a form you are required to complete that will go over any food allergies or issues anyone in your party might have. Cost starts at $195.00 per person excluding beverage, tax and gratuity. This visit they offered shaved Perigord truffles on a couple dishes for a extra $55.00 per person. Alcohol pairings start at $130.00 on up. There is also a non-alcohol pairing, but I don't recall the cost of that one. I have never gone with one of the pairings, instead since the menu is grouped in three food flights I select in advance three wines, usually going with suggestions made by the Sommelier/Hostess. Our party of six would take up most of e' along with two other ladies who joined the fun that evening and were nice enough to take this photo of our group. That's Laurie in front on the left, Cassie with the fan, Alicia, myself, Mike and Manette. After our group had selected their beverages we were led past the bar and to the left into a small private room which is very whimsical and surreal. 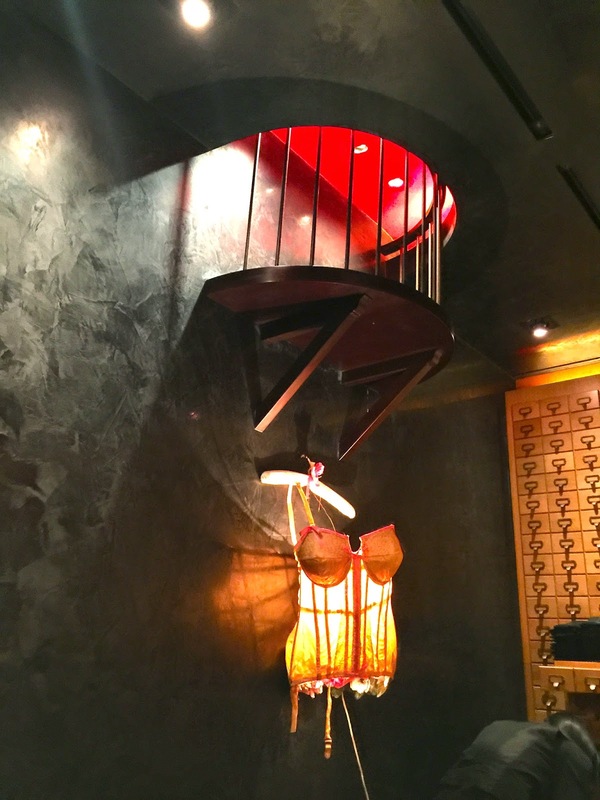 It's the vision of the inside of Jose Andres's mind! 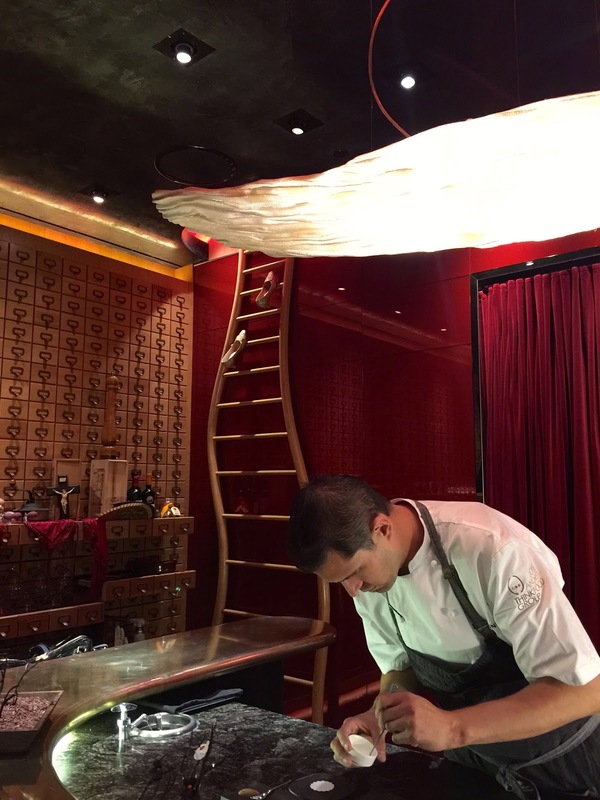 All the objects decorating the room have some hidden or perhaps obvious meaning to Chef Jose Andres. The ceramic hand holding the warm towel wrapped in lavender is a actual reproduction of chef Jose Andres's hand. Jose is know for creating new flavor combinations and turning classics dishes using "molecular gastronomy" into well, what you will see in photos below. "Drunken Truffle", which had foie gras inside. I liked it even though it does have a spongy texture and a grainy exterior. I noticed some in my party only ate a little bit of it so not all were a fan of this course. Not sure what the above was and while I remember I liked this, I can't recall now what it actually was, my bad! "Branch of the desert", edible centerpieces, one for every two guests. Dark branches with delicate looking pansy flowers. The branches were made out of liquified kalmata olives that were then shaped into crunchy branches. I love kalmata olives and enjoyed eating part of this lovely centerpiece. My glass of Raventos Rose, it paired well with the first flight of courses. Really liked this, lets call it a cheese cracker, LOL! "Filipino", looks like a small chocolate covered donut but has a soft foie gras filling. I enjoyed this though not usually a fan of foie gras. Potato Glass with an anchovy paste. Loved the potato glass which was thin, crunchy and tasted like the best potato chip ever. Personally didn't care for the anchovy paste though others enjoyed it. "Beet Gazpacho"! If you like beets, which I do you will enjoy this. It was like a frozen beet sandwich, think ice cream sandwich without the ice cream! "Merienda"! Second time I have eaten this at e' and still love it. Traditional snack of the type of sandwich children in Spain are given and this is the e' version of it with a wonderful Spanish goat cheese and Iberico. Okay, so basically a delicious ham and cheese bun snack! "Clams in Escabeche", last year I was brave enough to try this dish of raw clams as normally I don't care for any raw seafood or shellfish and I thought it was fine. This year I told them I would prefer no raw seafood so here's the dish without it. "Cheese and Nuts", cheese that had a hard outer shell with tangy sharp white cheese inside and a small spoon of tiny balls of what tastes like nutella. We were told to take a bite of the cheese, eat the nuts, and finish off the cheese bite. One of my favorites, I loved this cheese and who doesn't like the flavor of hazelnuts and chocolate? "Cava Sangria", it's a party in your mouth! 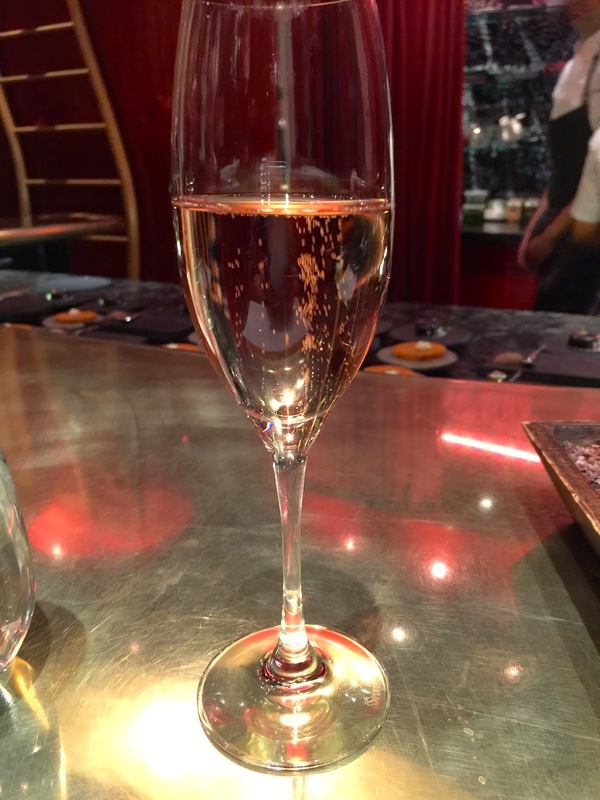 Pop the sphere in your mouth and a gush of Cava fills your senses. I also like Cava in a glass, but for presentation just too cute. One of my friends doesn't drink, so her course didn't include the Cava Sangria, instead she got the pear below. I'm not sure what the red is on it or the garnish. My next wine was the one in the photo below. I liked it! Plating of the next course, "Fabes Con Jamon". The "Fabes Con Jamon" course above is mine with the shaved Perigord Truffles. The dish below is what the guests were served that didn't go with the Truffle supplement. While not listed on our menu of the evening I've had this on a previous visit so I'm naming it what it was called last year. Basically this is the fanciest ham and beans you might ever eat. Lots of flavor and textures made up of ham broth, chickpeas with some parsley oil. The globe appearing chickpeas were filled with a chickpea liquid. "Live Scallops with Black Truffle"-the scallop was alive a few minutes before they begin to plate it, it doesn't get any fresher then this for scallops. Normally I don't eat raw shellfish but I love scallops so I went with it. It was excellent and the truffles shaved on top were a great smokey finish. I will confess that I still prefer my scallops cooked, I think it's a texture issue with me. These photos demonstrated the plating we are watching as we are enjoying one course and watching them put together the next. "Txipirones", squid with rosemary foam, and the squares I believe were jellied olives. I ate the jellied squares and gave my squid to Mike. "Platija", squid ink crusted Fluke. Most had a pool of squid ink around their fish, I requested they not put any around my Fluke as I'm not a fan of it. The dried squid ink that was crunchy on top of the fish I liked. Presentation of "Chuleta", the Wagyu beef before it's cut and plated. "Chuleta", rare Wagyu beef with black truffle gnocchi. My Chuleta had shaved truffles. This was a bit too rare for my personal taste but it was delicious. While I like gnocchi, I didn't care for the e' version. The start of preparing the cotton candy savory"Empanada" with foie gras! I found it fascinating to watch her work with the cotton candy! Close up of my "Empanada"with the cotton candy on top. I liked it and I'm not a fan of foie gras! My last wine selection was one of my favorite dessert wines. I first had this last year at e' at Jose A.
I'm almost positive this is the "Santa Gradea" but darn if I can remember all that was inside of it. I know I ate and enjoyed it but I was starting to enter a food coma at this point, LOL! Plating the Crema Catalana Egg! "Crema Catalana Egg" is a deconstructed cream dessert made with egg and then reassembled to look like one. Think of this as a type of creme brulee. "After Eight Timbal", think best thin mint ever with a liquid center of goodness, painted with gold! Inside the "After Eight Timbal"! What is he stirring above? It's the same as the assistant was stirring earlier off to the side when the cotton candy "empanada" was being prepared. It takes a while to burn off all that rum! This burnt rum coffee drink was the result! "Ferrero Rocher", e' Jose Andres's version of this delightful sweet served in a red ring gift box. OMG, Yum! "More things", as listed on the menu was four small desert bits. I was full but somehow found room to eat most of them, they were delightful. My check for the evening which was a bit higher then some due to the $55.00 charge for the truffles. Our chefs, their assistants and the sommelier hostess are in the two photos below. A staff of eight to serve a group of eight and the service was perfection! 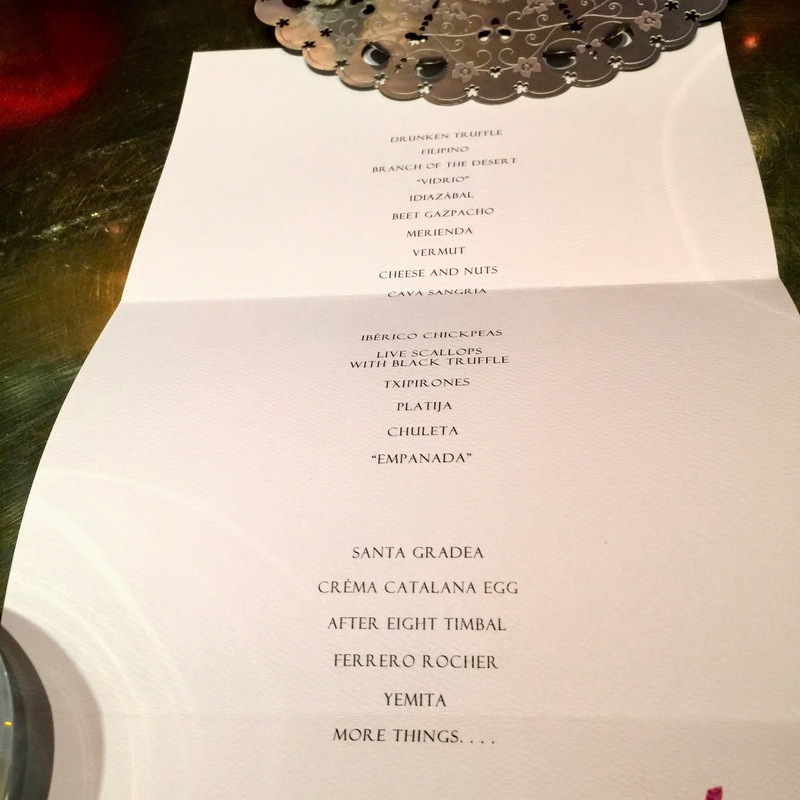 My final thoughts is that e' at Jose Andres has increased the wow factor of the food and presentation. It's very expensive to eat there but for me, it's worth it. While I missed a few past favorites, I was impressed at how the complexity and variety of tastes are increasing and improving. This is saying a lot from me because I was pretty blown away with the experience the first time I ate at e'! The pace of the experience is quicker too but it has to be due to the additional courses now offered. I look forward to what is in the future as I will likely return in a couple years to enjoy this experience again with friends. Wow, that looks amazing. It'll be our 20th wedding anniversary when we come again next year so we might have to give that a try as the celebration meal! What month is your anniversary? I know this year your trip is in June, are you doing the day and week countdown now? That's funny, we were just saying the same thing that perhaps it wouldn't be that romantic...great minds think alike! Our anniversary is on 15th June so we'll just miss it this year but plan on being there for it next year. As far as the countdown this year it's 45 days to go!! Can't wait to get there, it's driving us both mad - it's all we can think about!! The closer it gets the slower the time goes. :) Going to be a fabulous trip for you two! I'll see SDGuy next month in Vegas but I'm sorry I'll miss your June trip! I'm glad you enjoyed your meal, but those prices are crazy stupid high. Have a great trip with SDGuy....is that the trip with Brent and Dan too? I seem to remember Dan mentioning on SlotTalk that they were planning a trip in May. Sounds like it's going to be quite the party...what a shame we'll miss you all by a few weeks. I must say I was very impressed by your stamina on this last trip, you pulled in some very early mornings! It really is a shame we won't get to see you this trip. I had very little sleep those 5 nights and it took its toll. I literally did a face plant on the bed after my husband picked me up from the airport and didn't wake up until about 15 or so hours later, LOL! It was worth it since there were so many people I knew in Vegas this month and even then I didn't get to spend as much time with a lot of them as I would have liked. This next trip I'm taking it easy and getting my 8 hours sleep, . We'll meet again I have no doubt...and we'll try and do you proud on our trip but I can't guarantee we'll be able to stay up as late as you...lol. I'm looking forward to reading on Facebook about your trip, either during it or after. How long did the whole dinner/experience take? Between 2 and 2 and a half hours as I recall.